This was one of my more unusual orders. Maybe its the fact that the customer was the Canadian ambassador! 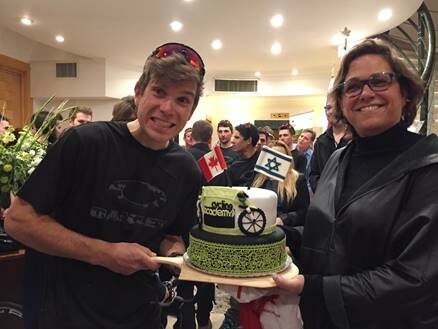 I had to create a cake for a world class Canadian Cyclist who was joining the Israeli team. Event – Israeli cycling team celebration. Challenges – Making the flags on top of the cake stable enough to last through a 1 1/2 hour car ride. When it comes to making a themed cakes, I’m always careful to maintain the elegant, clean look I strive for in my cakes and at the same time incorporate in different sculpted objects such as a bike that can look rather childish and definitely not elegant. In this case, I was glad to find out that the team’s logo was relatively plain and modern and contained a striking contrast of colors, lime green and black. I think what really topped it off was the use of that exact color scheme on the bottom tier,lime green lace on a solid black background. As for the bike, being the only prop I did go into a bit more detail, but sticking to those two basic but important colors, black and white.